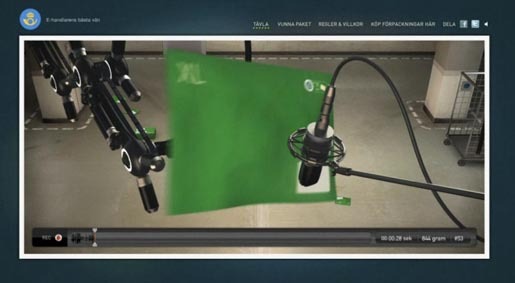 Swedish Post (Posten) used “Sound of Green” interactive advertising campaign (Ljudet av vadsomhelst) to raise awareness of their range of pre-franked parcels. The campaign was designed to tell people that it is possible to send almost anything over night with the green parcels. Eighty specific sounds were recorded by shaking eighty different parcelled objects. Visitors to the Sound of Green site, ljudetavvadsomhelst.se, were invited to guess what was inside each of the boxes judging from their sounds. The first to guess each box would have it sent to them overnight. Chances of winning were increased by improving the quality of sound, using a slider on the site, or asking a friend on Facebook. The Sound of Green campaign was developed at Akestam Holst by creative director Andreas Ullenius, copywriter Hanna Bjork, art director Lars Holthe, account manager Jacob Stjarne, production manager Maria Ljung, planner Lars Friberg. Web production was done by From Stockholm with Love.